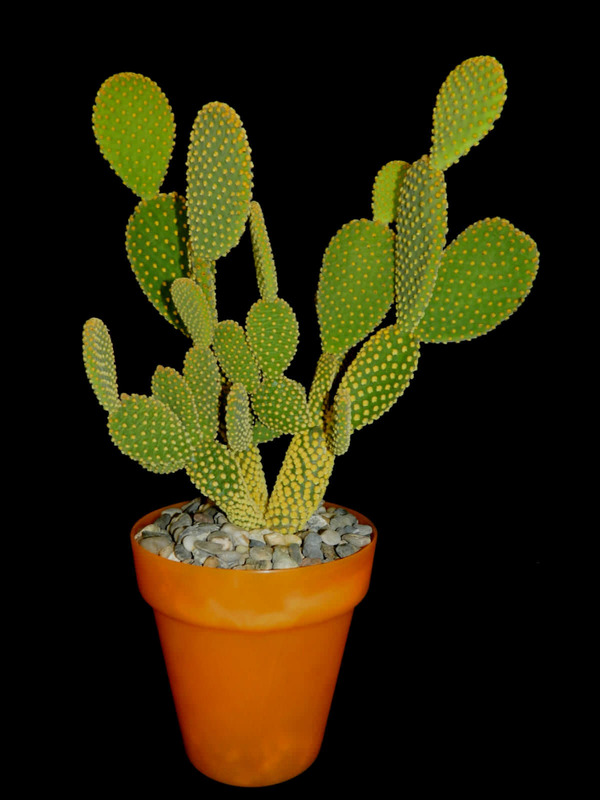 Opuntia microdasys is an evergreen perennial that forms a dense shrub up to 24 inches (60 cm) tall (occasionally more), composed of green, pad-like stems, up to 6 inches (15 cm) long and up to 5 inches (12.5 cm) broad. 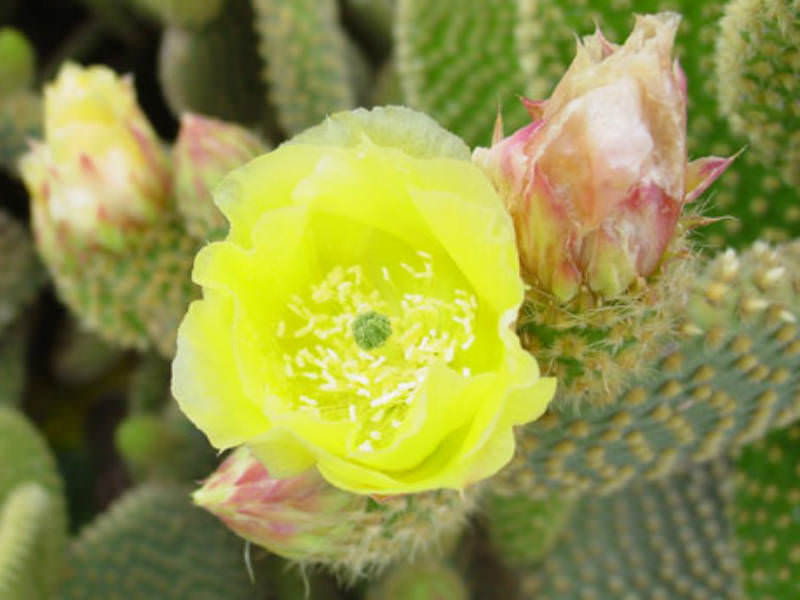 It has no spines, but instead has numerous yellow glochids (micro-spines) up to 0.12 inch (3 mm) long at each aureole. 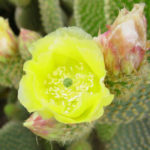 The flowers are up to 2 inches (5 cm) across and have broad, yellow tepals, yellow anthers, and dark green stigma lobes. The flowers are followed by round to egg-shaped, up to 2 inches (5 cm) long, red to purplish, spineless but glochid-dotted fruits. 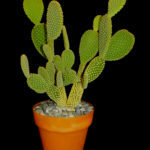 A spot near a south-facing, unobstructed window is most likely to meet Bunny Ears Cactus’ need for bright, direct sun. Windows with western or eastern exposure run as second and third choices. 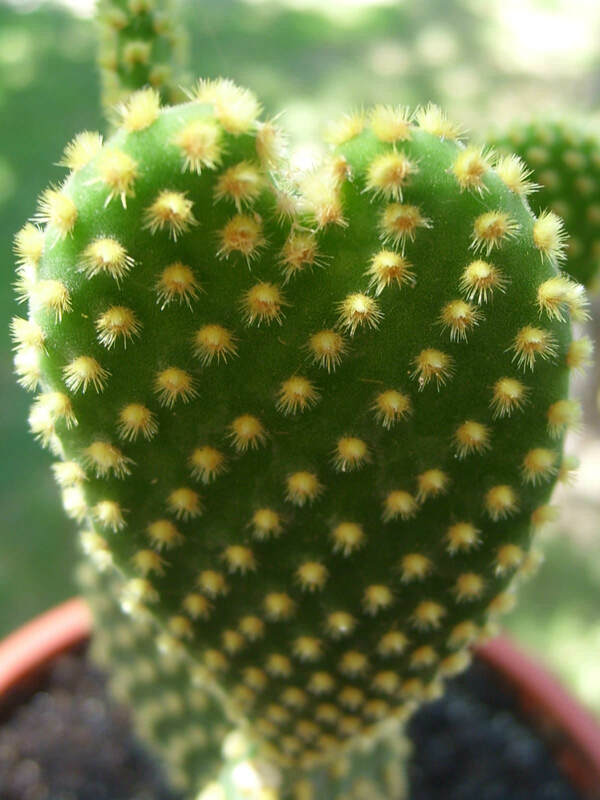 While an actively growing Bunny Ears Cactus tolerates indoor summer temperatures as high as 100 °F (38 °C), don’t expect it to flower unless you also provide winter temperatures between 45 and 55 °F (7 and 13 °C). Regardless of the season, it likes humidity in the 10 to 30 percent range. Finally, if none of your windows provides adequate light, place the plant 6 to 12 inches (15 to 30 cm) below a cool white fluorescent tube for 14 to 16 hours each day. 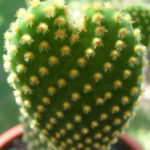 Opuntia microdasys is native to central and northern Mexico.